​I am grateful to say that I was brought up in a Christian home and church where seeking to reach those outside the church for Christ was part of the culture. I grew up inviting people to Vacation Bible School, and participating in other forms of outreach. After I was married, while helping a church down South, I became acutely aware of the multiplicity of churches in the area. I saw more clearly than ever that much of the obvious “unfinished business” of the church was to reach the lost. While serving at a Bible college on the island of Trinidad I saw my purpose as fulfilling the second part of the Great Commission—to train disciples of Christ to do “all things commanded.” This was a need in Trinidad, but I became increasingly aware that the second part of the Great Commission cannot be divorced from the first. And I saw the Lord’s blessing on evangelistic work. About a year ago I went through a period of severe depression. The Lord pulled me out of this, and taught me that the cross of Jesus Christ alone was powerful enough to sustain me in my Christian life and keep my “head above water.” He used a book by CJ Mahaney, Living the Cross-Centered Life, to help me see the abiding significance of the cross for Christian sanctification. Scripture passages about the cross became a constant source of strength, and songs such as “Jesus, Keep Me Near the Cross” by Fanny Crosby, and “My Sin is Nailed to the Cross” by the Northern Irish band Rend Collective, became a consistent source of solace. I need the gospel daily to survive. Then some months ago I read the new work Developing an Ecclesiastical Evangelistic Culture, by Henry Krabbendam. The Lord used this to help “defog my windshield” and see that the passion and purpose of Christ in coming to earth is, by the Holy Spirit, the passion and purpose of His church—the salvation of the lost. Over the past year and a half the Lord used other people to encourage me into evangelistic endeavor. He used my pastor, James Zozzaro, to point me in this direction. He used Mike Evangelista to provide opportunities. 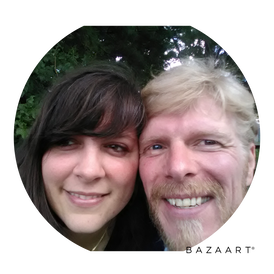 He used Brent Kilman, campus pastor with Reformed University Fellowship, to help me see practically the beauty of Christ’s pattern of sending us out “two by two.” He used my wife to encourage and support me. He helped me through the prayers of the saints. He showed me the beauty of the body of Christ in action, mobilized to fulfill the mission of Christ Himself in order that, as the Moravian missionaries reportedly said, the Lamb who was slain may receive the reward of His suffering.